Ruby Red & Rocket Chard! OUT NOW! ​"Adams lessons have brought my playing on leaps and bounds. His good natured, laid back attitude was just what I needed to give my playing a kick start. I cannot recommend him enough." Private lessons with Adam are now available worldwide over the internet via Skype. Skype is a totally free service, very quick and easy to use. All you need is a computer, web-cam and microphone (most Laptops now have cameras and microphones built in). ​"I’ve been enjoying Skype lessons with Adam for over 2 years now and rekindled my passion for playing the guitar and for blues music altogether. Adam is not only incredibly talented but also very encouraging and supportive. He teaches finger-picking and slide techniques in a very practical and structured way. Skype is also a great way to learn as you can do it from the comfort of your home in full view of the fretboard! Would highly recommend." Skype lessons are the same as a private one to one, just using a camera & saving on travel costs! Everything covered in the lesson can be sent as a video file and downloaded to be kept for future use. Students can learn all styles of Blues, Finger picking & Ragtime on Guitar, mandolin and Ukulele. ​It was impossible to find one in Germany at that time. Skype classes were completely new to me, but my scepticism was quickly gone when I realized how much fun it was to learn to play a new instrument, and how easy and natural it can actually be. Adam is not only a great guitar player (I have now also taken up guitar) but also a very encouraging teacher with an outstanding knowledge of this beautiful music from the past. A class with him is always something to look forward to. I can only recommend taking classes with him, but beware: his enthusiasm and his humour are contagious!" The slide guitar style of Tampa Red, Memphis Minnie's 'When The Levee Breaks', Blind Boy Fuller's 'Untrue Blues' & 'Walking My Troubles Away', Sylvester Weaver's 'Guitar Rag', Robert Johnson's style in standard & open tunings, the mandolin style of Charlie McCoy, Hot Jazz Ukulele and Country Blues Ukulele Fingerpicking. 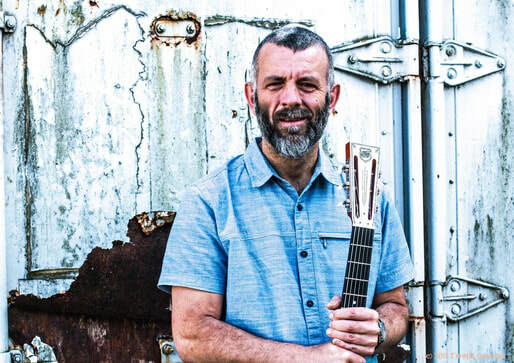 ​A professional musician for over 25 years, Adam performs all over the world and has been teaching guitar & ukulele since 1992. Priced at £20 per 30 minute session, £25 per 40 minute session, all lessons are bespoke tailored and paced to suit each individual student. Click here to book your skype lesson now! Slide guitar lessons Chichester, Slide guitar lessons Bognor Regis, Slide guitar lessons Worthing, Slide guitar lessons Littlehampton, Slide guitar lessons Brighton, Slide guitar lessons West Sussex, Slide guitar lessons East Sussex.